The Tam Valley Halloween Parade is full of everything from zombies to princesses to pop stars and book characters. Our Halloween celebration is a fun-filled day for kids at Tam Valley. Kindergartners come to school in costume and parade through the school the first hour of the day. 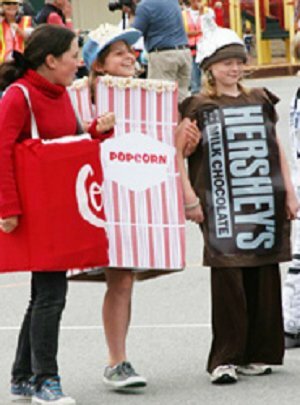 The older grades of 1st through 5th graders come to school in their regular clothing and bring costumes in a bag. The last hour of the day, they change into costume and take part in the grand parade on the blacktop. Parents are invited to join the kids for the costume parade as , students sit with their classes in a large circle and are called up by category to strut their stuff. Students then join their classes and parade around the blacktop. There are sure to be a surprise or two. After the parade students enjoy popcorn and juice at the lunch tables. This year our Halloween Parade will take place on Monday, Oct. 31, 2017: K - 8:20 and 1st-5th - 1:25.